In the southern border fragrant Paeonia ‘Festiva Maxima’ blooms this week. Its large double, white flowers are flecked with a slight accent of red. I selected two for this week’s vase. 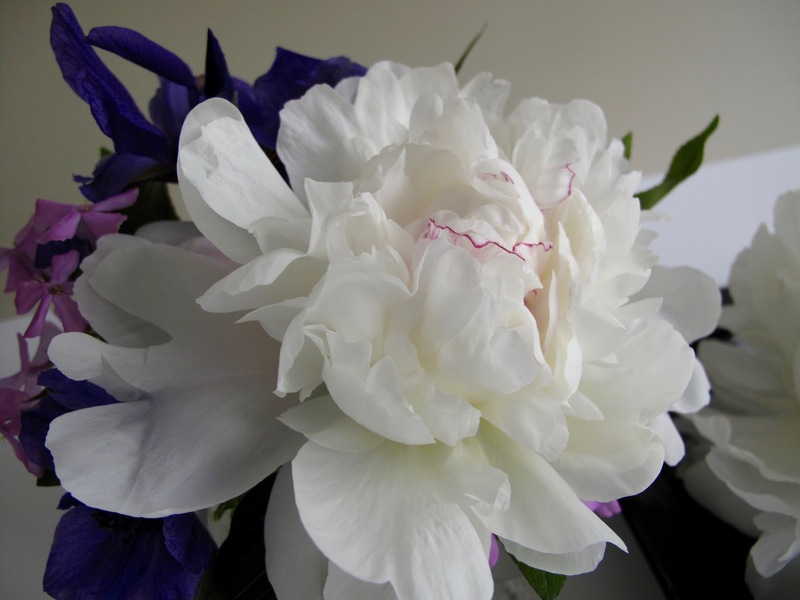 The larger peony measures over 7 inches across. Secured in place by a kenzan or floral pin frog, the majestic giant hovers gracefully just above the top of a black, glazed ceramic dish. The juxtaposition of the circular form against the square container is repeated in the second part of the arrangement with a round posy in a glass cube. 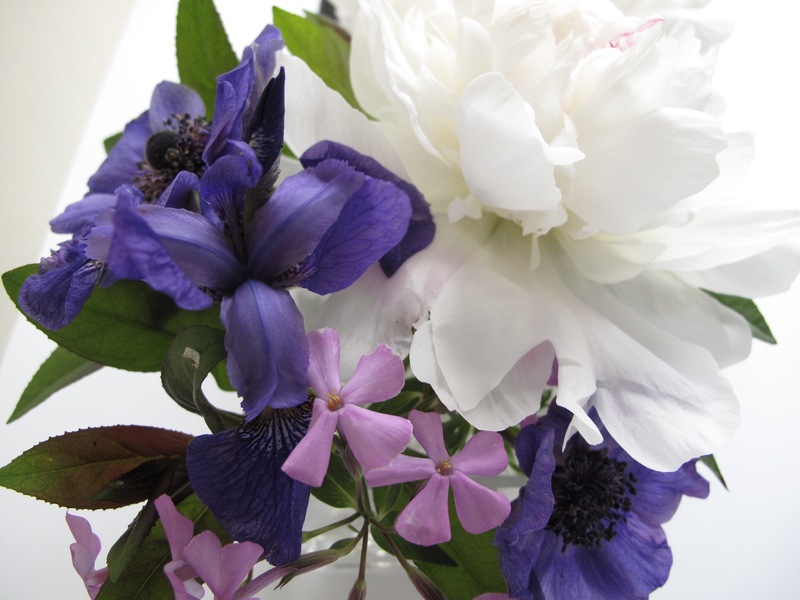 Along with the second Festiva Maxima peony, the posy consists of a Siberian iris, two Anemones and a couple of sprigs of pink Phlox divaricata. Thanks to Cathy for hosting this weekly flower arranging addiction. Visit her at Rambling In The Garden to discover what she and others are placing In A Vase On Monday. Feel free to join in. This entry was posted in garden and tagged Anemone coronaria ‘Mr. Fokker’, flower arranging, flower design, in a vase on monday, Iris sibirica (Siberian Iris), nature photography, Paeonia ‘Festiva Maxima’, Phlox divaricata (Woodland phlox) on May 2, 2016 by pbmgarden. I’m almost without words at the beauty of your arrangement this week Susie. Just wonderful! 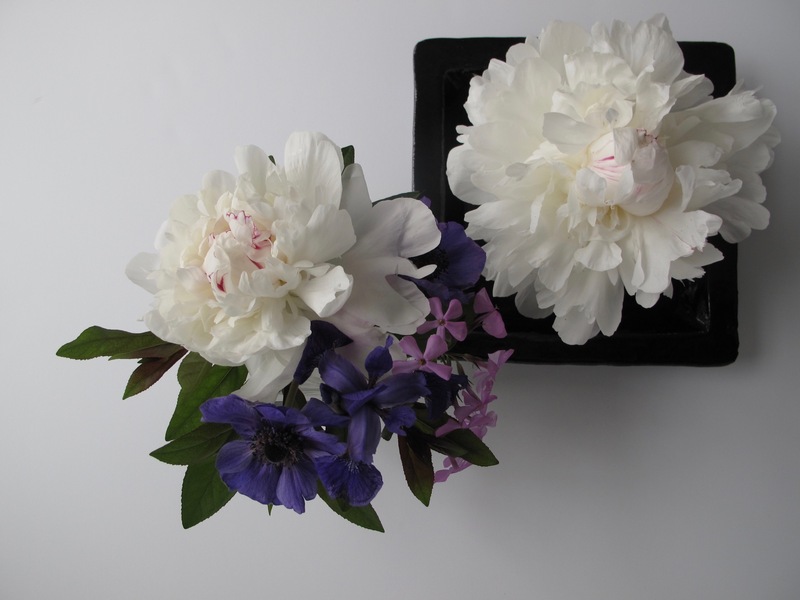 Thanks Christina, these peonies didn’t need much help this week. They’re so lovely on their own. I love highlighting just the flower. Thanks Cindy.The large blooms don’t seem to need much else. Your arrangement is once again a winner. You know how I love peonies. Yours was simple and elegant John. It’s good to just let the peonies shine through without distraction. One of the best Peonies ever! I have fond memories of it from childhood. Makes for a beautiful presentation. Circa 1851, it is a very old type of peony, Linda, although mine is just two or three years. It’s very reliable. I cannot get over the flowers you have blooming….those same flowers won’t grow here until June….but oh those peonies are fabulous! You’ve certainly been much cooler than we have, although our spring has been nice and slow, giving the plants time to open gracefully and age gracefully. Feels like summer outside today after a very cool, wet weekend though. Thanks Cathy. I agree, the blue anemones are most prolific here as well. They’re fading quickly though as it gets hotter. Festiva Maxima already in bloom, just lovely! Thanks Anca. I’ve been watching the peony buds for such a long time, then suddenly this week they burst into bloom. A sigh was out of my lips the second I spied that peony at the top of your post, Susie. I suffer from a serious case of peony envy and ‘Festiva Maxima’ is a gorgeous specimen. In truth, I envy the anemones too – our February heatwave knocked out all chances of an anemone display this year. The peonies are the pride of my garden this week, Kris. Glad you’ve enjoyed them. Very few anemones left here now, winding down. None of my new ones planted last fall produced any flowers. We inherited a Festiva Maxima with our house, so it must be close to twenty years old. And it is gorgeous! And every year it has more and more flowers. They just started blooming yesterday so I will try to post some as I cut and arrange them. What gorgeous flowers indeed. I love yours with the purples; very lovely and oh so spring! This Festiva Maxima came from a plant exchange a couple of years ago. Good trade. I must say Christina is right, Susie, it’s just stunning. I like the simplicity and yet deep thoughts that go into each of your arrangements. Thank you Annette. I’ve been inspired by my new black dish–it has proved to be valuable. When the peonies opened this week I instinctively knew they had to star today. What can I say Susie – my favourite flowers!! These are so beautiful and you have displayed them to perfection. Julie, thanks so much. I’m glad to share the peonies with you today. My interest in them is only a few years old, never having noticed them much before. Now I like them as much as camellias and gardenias. Thanks Cathy. Festive maxima has such presence, it didn’t take much work from me. Does smell wonderful. Will look forward to seeing yours soon too. Meanwhile my are getting drenched from an afternoon thunderstorm–a real deluge. I should have cut more! 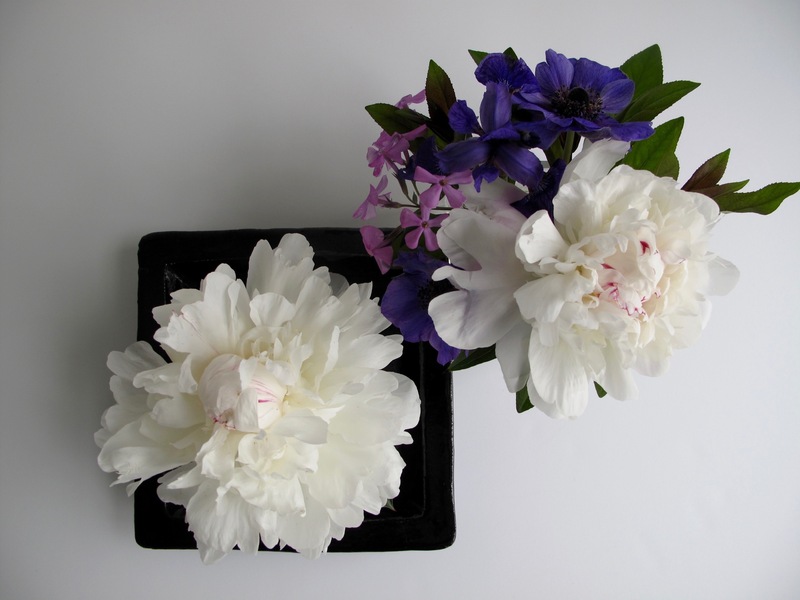 That is so typical here too – as soon as the peonies have opened completely we get heavy rain! Hope your beauties aren’t too spoilt. I brought many indoors so have been able to enjoy them close up. It is such a beautiful peony, I love the way it is lightly touched with pink. I think we all agree that your arrangements are so stylish and simply stunning. You are so artistic Susie. Thank you, so kind. This peony is one I’d misidentified one year so am always grateful you helped me learn the proper name. 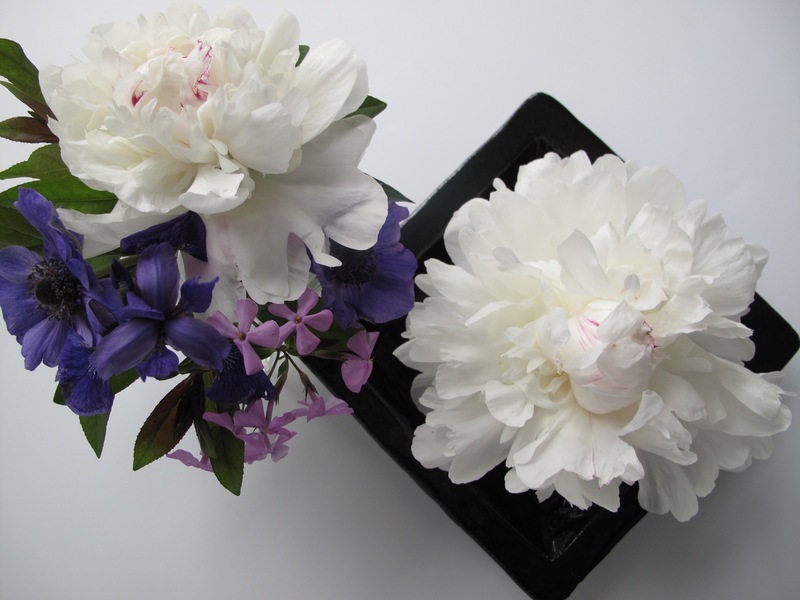 The simple hint of red in the white peony is delicious. What an artistic arrangement. The red accent is a nice touch, I agree. Thanks so much for your kind words. The peony seemed to need little assistance this week. Nice to have a flower in common across the miles. Seems like no time that my peony was 8” tall–you’ll be enjoying your flowers and the scent soon I hope. A beautiful modern arrangement with a lovely peony new to me. Thanks Brian. Festive Maxima is widely grown where I live in Southern US. It blooms early before it gets too hot. Black vases so enhance white flowers, I’m wanting to get one. Your arrangements look so elegant, Susie, the Festiva Maxima Peony is so full and ruffly, and I like the little red line on the petals. 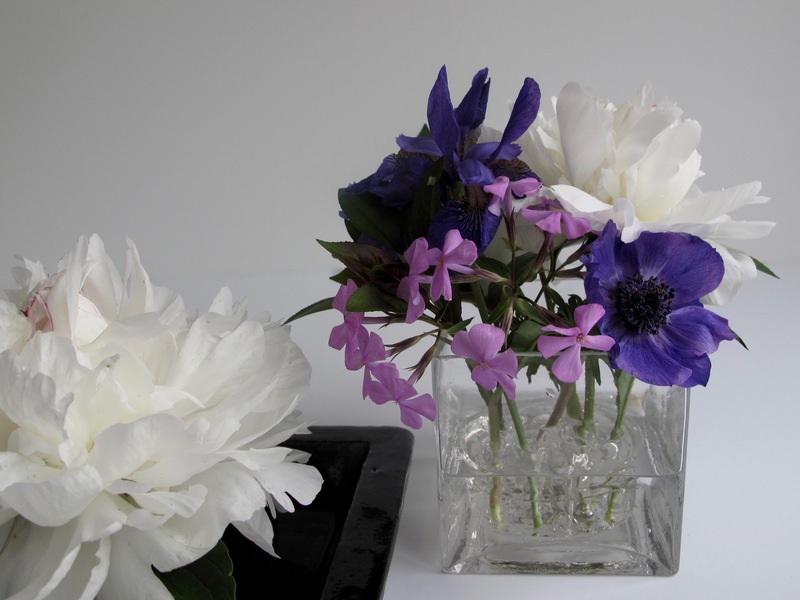 The deep purple Anemones and pink phlox are such pretty accents with the white. Hannah, the black dish makes all the difference in this arrangement. I’d been wanting one for a long time. You should get one too. Wow, what a beautiful Peony. I’m envious too. I didn’t realise they are scented as well. Your designs are always so perfectly balanced in colour and form. 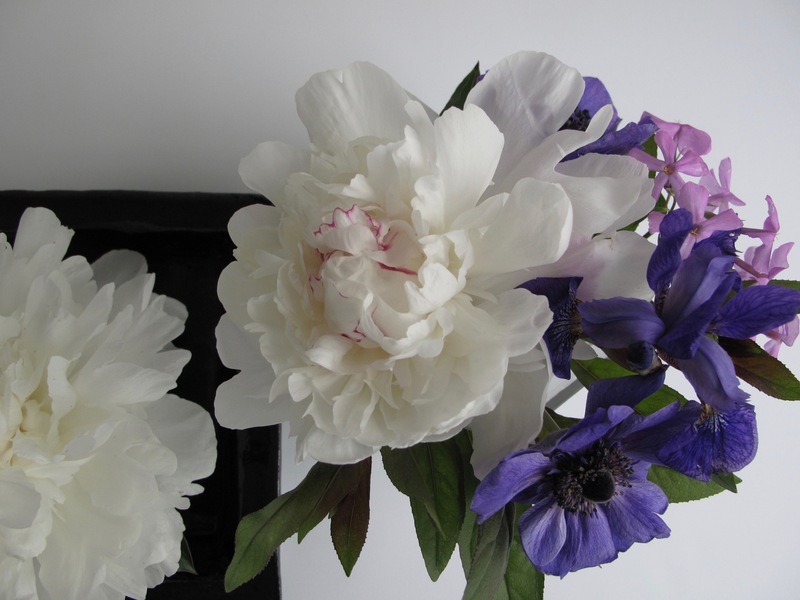 The deep purple is intense and really showcases the peony. Thanks Cath. The fragrance is a nice bonus for such a lovely flower. In some of the images that purple is a bit overstated. Purple or white is difficult to photograph well sometimes and this combination proved a challenge. ‘Festiva Maxima’ is a majestic and joy-inspiring peony. Agreed. We’ve had storms all week, ever since the peony began blooming, so I cut 6 or 8 and brought them inside. They smell great, although they don’t last well. 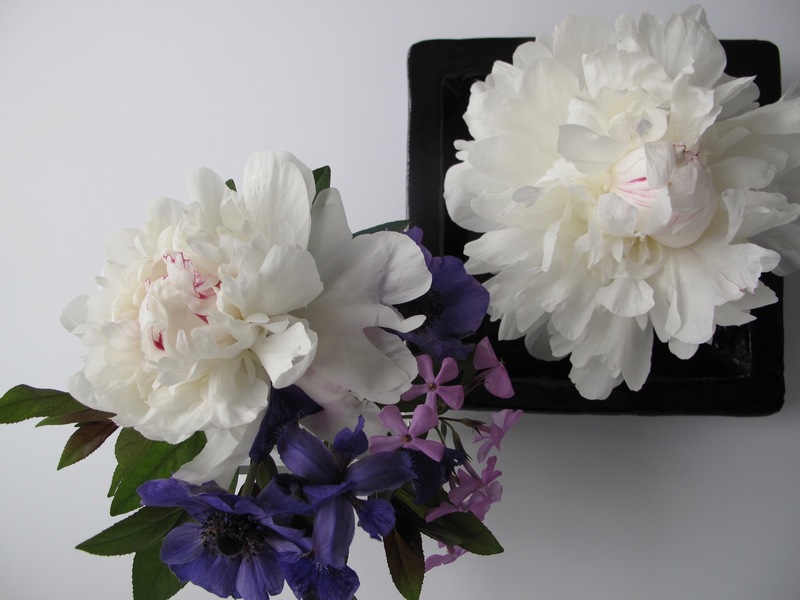 ‘Festiva Maxima’ peony is lovely, especially on the black ceramic dish. Thanks, buying that black dish was a great investment. ‘Festiva Maxima’ has been rewarding this year, but had to enjoy it indoors mostly–salvaged many flowers before the rains.